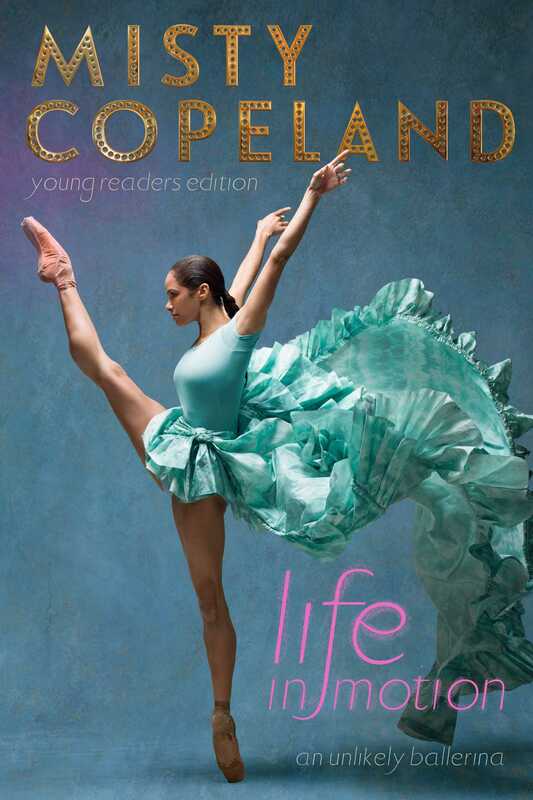 Determination meets dance in this middle grade adaptation of the New York Times bestselling memoir by the first African-American principal dancer in American Ballet Theatre history, Misty Copeland. As the first African-American principal dancer at the American Ballet Theatre, Misty Copeland has been breaking down all kinds of barriers in the world of dance. But when she first started dancing—at the late age of thirteen—no one would have guessed the shy, underprivileged girl would one day make history in her field. Her road to excellence was not easy—a chaotic home life, with several siblings and a single mother, was a stark contrast to the control and comfort she found on stage. And when her home life and incredible dance promise begin to clash, Misty had to learn to stand up for herself and navigate a complex relationship with her mother, while pursuing her ballet dreams. Life in Motion is a story for all the kids who dare to be different, dream bigger, and want to break stereotypes in whatever they do. FOR AS LONG AS I can remember, I’ve led a life in motion. When I was two years old, I rode a bus from Kansas City, Missouri, to our new home in Southern California. I was the youngest back then, with two older brothers, Doug and Chris, and an older sister named Erica. Mommy moved us away from our father to a sunny suburb of Los Angeles called Bellflower, where we would live with her new husband, Harold. I don’t remember the bus ride, but when I think back to those years, I always remember my time with Harold. He liked jokes and he had a great laugh, one that would make everyone around him laugh too. My baby sister, Lindsey, was born after we’d lived with Harold for three years, so I wasn’t the youngest anymore. But even with five of us kids to look after, Harold would find time to spend alone with each of us. I loved when I’d sit on the couch with him, eating sunflower seeds. But when I was seven, Mommy decided we needed to leave our home again. Without Harold. And Lindsey was coming with us. This was the second time Mommy had packed us up and moved us to a new place, and we didn’t know why. We loved Harold. Later, she would tell us he drank too much. He was an alcoholic. He mostly hid it from me and my brothers and sisters. But when I remember Harold, I don’t think of the beer cans that always sat on the nightstand he shared with Mommy. I remember how kind he was and how he made waffles for Lindsey and me on Saturday mornings while we watched cartoons. This time we moved only about twenty miles away, to a community in Los Angeles called San Pedro. Even though we were in a big city, San Pedro felt like a storybook town, where we had bonfires on the beach and took school field trips to a lighthouse. Part of the Port of Los Angeles is located in San Pedro, where goods like furniture, clothes, and car parts are shipped in. Our new house was close to the Pacific Ocean, with a big front yard and a view of Catalina Island. It also had a new stepfather, named Robert. We missed Harold, and it didn’t take long to notice the differences between Mommy’s old husband and her new one. Robert was stricter. He made us do chores around the house, and we ate breakfast, lunch, and dinner at the dining room table instead of on the couch in front of the TV. Robert called me “little Hawaiian girl” and said I looked like his family. Like me, he was of mixed ancestry. His family had roots in Hawaii, Korea, the Philippines, Portugal, and Japan. Mommy had been adopted by an African American couple, but her biological parents were Italian and black. Our father, whom we left in Missouri, was also biracial, with a black father and a German mother. I guess I did look a bit more like Robert’s family than my brothers and sisters, but I didn’t think about that when we were together. I loved them, and we were a united force. Still, the way I looked mattered to Robert, and especially to his family. Everyone knew I was Robert’s favorite, and soon it became clear that his family felt the same way. I went over to his parents’ house in the summer, where Grandma Marie taught me how to sew clothing for my dolls. But Doug, Chris, Erica, and Lindsey almost never came with me. And Robert’s father, Grandpa Martin, would hide in his bedroom when all of us visited. I don’t remember him ever speaking to me or my brothers and sisters. Robert was strict about us kids helping clean up around the house. We would get in trouble if we didn’t follow his rules. He made us stand in the corner without talking. Doug and Chris were punished more often than us girls, though. They’d have to stare at the wall for at least an hour, and sometimes Robert would make them stand completely still as they balanced a thick book on their heads. I didn’t like when they were being disciplined, especially when Robert was particularly mean. Like when he dragged Chris across the house by his ear. Or worse, when Robert got so mad that he hit Chris with a frying pan. But he didn’t stop there. When Chris and Doug would argue with each other, Robert made them work it out by boxing in the backyard. “Since you guys can’t agree, you’ll have to fight it out,” he would say. We all became so scared of him that we tried our best to make sure the house was always in perfect order when he was home. We avoided him as much as we could. My big sister, Erica, slept over at her friend’s house, and I would spend a lot of time with Doug and Chris in the room they shared, listening to music by our favorite hip-hop groups. But no matter how hard we tried to stay out of his way, Robert would find a reason to be mad at us. And he was almost always mad at our baby sister. Lindsey resembled her father, Harold, and her African features were more pronounced than the rest of ours. Robert didn’t like this, and he blamed her for everything. I was shocked the first time I heard him call her the N word. But soon the slur would flow so freely from his mouth that none of us were surprised. Mommy was scared of Robert, too. She’d complain about him when he wasn’t around, but when he was being terrible to us, she wouldn’t say anything. She didn’t shield us from him, but she didn’t protect herself, either. After a while, our mother couldn’t hide the bruises Robert would leave on her skin. Mommy’s adoptive parents had given her a good home, but she was still young when they’d died. She’d had a hard childhood, moving a lot to stay with different family members. Sometimes we wondered if that’s why she moved us around so much. By that time, we had a baby brother, Cameron, Mommy’s son with Robert. We all rushed around the house, cramming our suitcases with as many of our belongings as would fit. A strange car pulled up to the house then, driven by a man we didn’t know. He didn’t look anything like Robert. He was a tall white man with brown hair and glasses. We quickly learned he was there to help, and he began loading our bags into his car. Mommy told us his name was Ray. He was our mother’s new boyfriend. Misty Copeland made history by becoming the first African American female principal dancer at American Ballet Theatre. The bestselling author of Life in Motion and a children’s picture book, Firebird, she is the recipient of the Leonore Annenberg Fellowship in the Arts and an inductee into the Boys and Girls Club Alumni Hall of Fame. In 2015, Misty was named to Time magazine’s 100 list and was one of Glamour magazine’s “Women of the Year.” She lives in New York City. Visit her online at MistyCopeland.com.